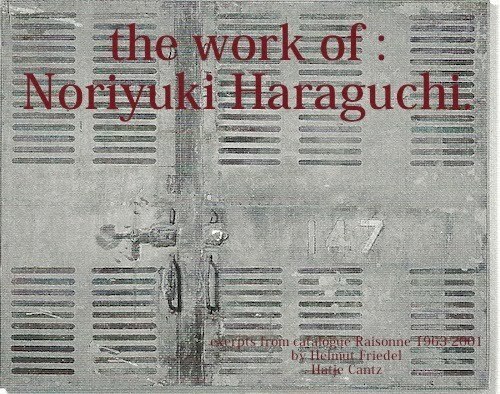 About 7 years ago I came across the work of prolific sculptor and painter, Noriyuki Haraguchi. His deconstruction of everyday industrial objects I find interestingly unexpected, simple and raw. His utilitarian, either dirty or crisp subject matters occupy space using layers of texture created from materials such as plywood, steel, paper, canvas and lacquers. Even though the discipline and mediums they work in are completely different, I see aspects of Noriyuki's aesthetic akin to Kow's work in some ways — perhaps because of their shared culture. I've always had an affinity for textured, patined, chipped, and crumbled surfaces juxtaposed to shiny, smooth and crisp surfaces. These properties I think draw me to the Maschine Krieger genre and what I appreciate about Noriyuki's work. A series Noriyuki produced from 1963-1965 captured these properties in his subjects; ships and submarines fashioned from lacquer on paper. With these subjects, the display cases the ships and subs are mounted in are considered part of the subject as a whole; the cases are constructed from lacquer on plywood and Plexiglas. Noriyuki Haraguchi's work still inspires me. I would like to experiment with his approach on some of my builds. Prior to modeling when I first viewed his work I wanted to do something similar to his ships and sub series with aircraft fuselages captured in resin blocks. What better way to marry sculpture with the art of scale modeling in an abstract, noncontextural manner. His creations vary in size; from small to very large, each suggest a weight, age and use to them. There is a zen approach to his subject matter seen in the pure use of material, the objects function, the requirements of space and surfaces in the abstract. Below and above- images of Noriyuki Haraguchi work cataloged in the book; Noriyuki Haraguchi, Catalogue Raisonne 1963-2001 published by Hatje Cantz and available on Amazon.